El Trébol, “The Clover,” is a tangle of highways and roundabouts in Guatemala City, where traffic grinds to a halt during the morning and evening rush hours. Colorfully-painted buses and cars compete for traffic lanes, as major avenues intersecting at El Trébol bring commuters and commerce into the city. The buses bring passengers from rural Guatemala and the broader urban area, dropping off riders who then make a beeline toward their destinations. Like many cities in Latin America, Guatemala City has grown rapidly since the 1970s. At the same time, the city’s 3,000-strong bus fleet is aging. When cars and school buses in the United States no longer pass emissions tests, they go up for auction, and enterprising operators from countries like Guatemala and Honduras drive them south. These “clunkers” are banned on American roads, but they’ll go on to work for years in Guatemala. Mechanics may refurbish the vehicles by adding fresh paint or more powerful motors — and by removing catalytic converters, even though the devices reduce pollution and are legally required in Guatemala. The result is that as traffic creeps along the multilane highways, pedestrians inhale some of the most polluted air in the country. The metropolitan area of Guatemala City is home to around 3.4 million people, making it the largest urban center in Central America, and the number of private vehicles has soared in the capital in the past decade. According to the World Health Organization (WHO), it’s the sixth most polluted city in the Americas. 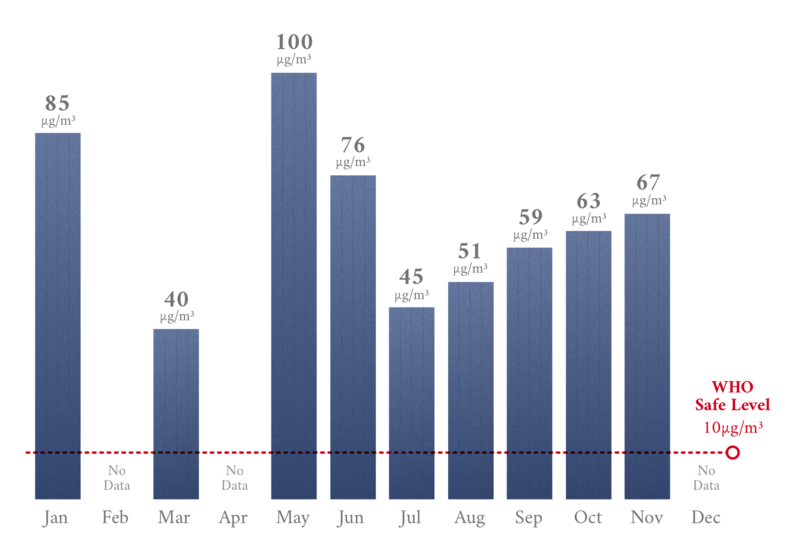 Yet, far from regulating air quality, Guatemalan authorities struggle to even measure it. Guatemala is one of many developing countries where air pollution is driven by an influx of used vehicles from countries with tighter environmental standards. A few miles southwest of El Trébol, the lush campus of San Carlos University feels like another world. I’m at the Chemistry and Pharmacy Department to meet Pablo Oliva, a researcher at the Air Quality Monitoring Laboratory. Oliva is soft-spoken but direct, and as we walk through the campus, he nods at colleagues passing by. Students lounge in the shade of palm trees, surrounded by murals depicting Guatemala’s social movement leaders. Entering the laboratory, Oliva explains that San Carlos researchers study the air quality at six points around the city. They don’t have automatic sensors, so they must manually collect air samples to process at the lab. The equipment looks practically antique, but Oliva says that the simple design is the most reliable. Repairs are costly, and replacement parts must be ordered from the United States. The WHO says that outdoor air pollution kills 4.2 million people around the world each year. That’s equal to the population of Montreal, or Rome, or Johannesburg. However, the link between air pollution and public health problems in Guatemala is understudied. Earlier this year, the Ministry of Health released data showing that respiratory illnesses are the most common cause of death in the country for children under 14 years old. According to Guatemalan pulmonologist Édgar Beltetón, young children are particularly vulnerable, and a cough that lasts more than four weeks is a common warning sign of a more serious illness. There are several different kinds of air pollution, but the ones that have the biggest impact on our health are tiny particles, about the same size as the red blood cells inside the body. 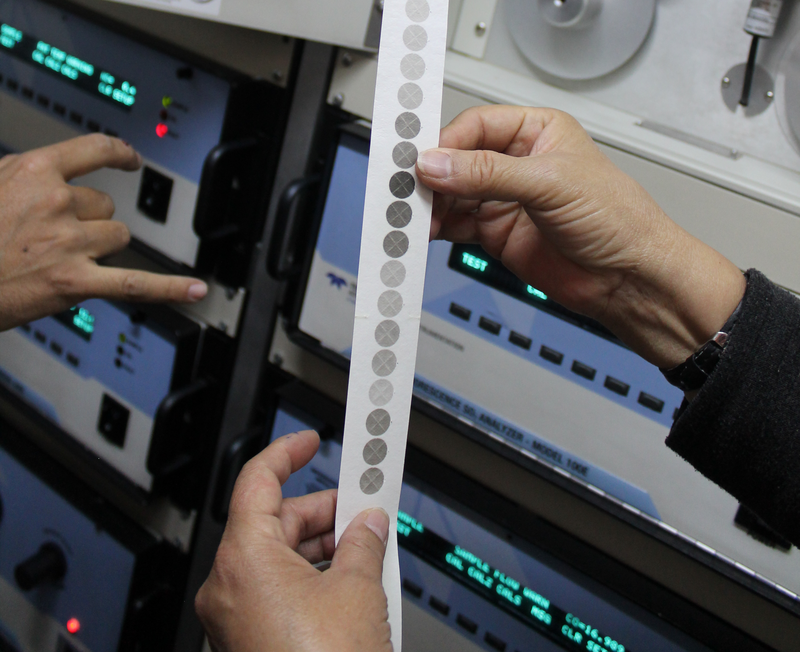 Measured in microns, or micrometers, these particulates are grouped into two categories: those smaller than 10 microns in diameter (known as PM10), and those smaller than 2.5 microns (known as PM2.5). Their small size allows them to penetrate deep into the lungs and enter the bloodstream, where they can cause numerous short- and long-term respiratory problems, including coughing, asthma, and even lung cancer. San Carlos scientists have been monitoring air pollution since 1994, and have published their findings in annual reports. 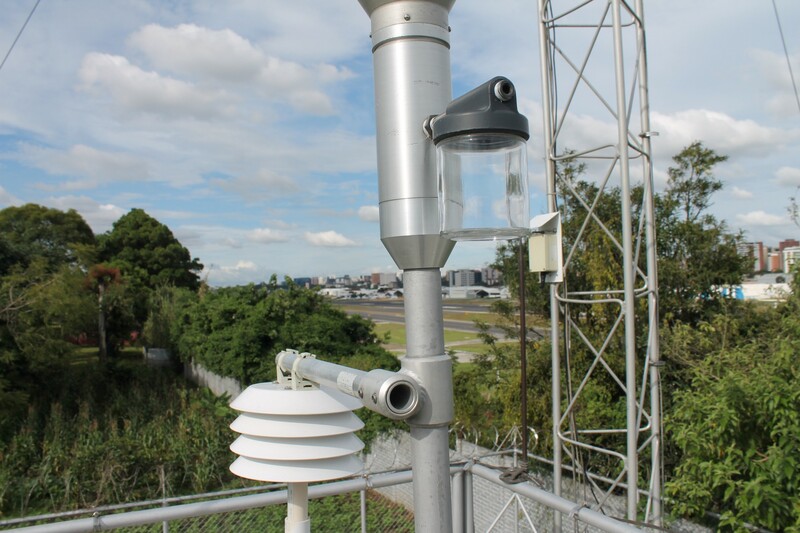 The lab measures PM2.5, nitrogen dioxide, sulfur dioxide, and acid rain. PM2.5 enters the atmosphere through the combustion of fossil fuels, or via sources like volcano ash. The WHO’s guidelines suggest PM2.5 levels below 10 milligrams per cubic meter as an annual mean, and recommend no more than 25 mg/m³ during a 24-hour period. But Guatemala City’s highest yearly average of PM2.5, measured along the major transport artery Calzada San Juan in 2017, was 65 mg/m³ of PM2.5–6.5 times higher than the WHO’s recommendations. Of course, the readings can be worse when researchers measure particulate levels within shorter periods of time. Every month in 2017, PM2.5 levels along Calzada San Juan dramatically exceeded safe levels. Data: San Carlos University. San Carlos and the private lab Ecoquimsa have recorded the highest levels of PM2.5 between 6 and 7:30 a.m., as cars, buses, and trucks depart during the morning rush hour. Near El Trébol, the researchers have found quantities of PM2.5 of over 800 mg/m³ during a one-hour period. “In locations where we have measured air quality, especially around El Trébol, just walking around can make you sick,” Oliva says. San Carlos scientists estimate that 70 percent of air pollution comes from vehicle emissions. Between 2007 and 2017, two million more vehicles were registered than went out of circulation, more than doubling the total number of vehicles on the roads — from 1.5 million to 3.5 million. 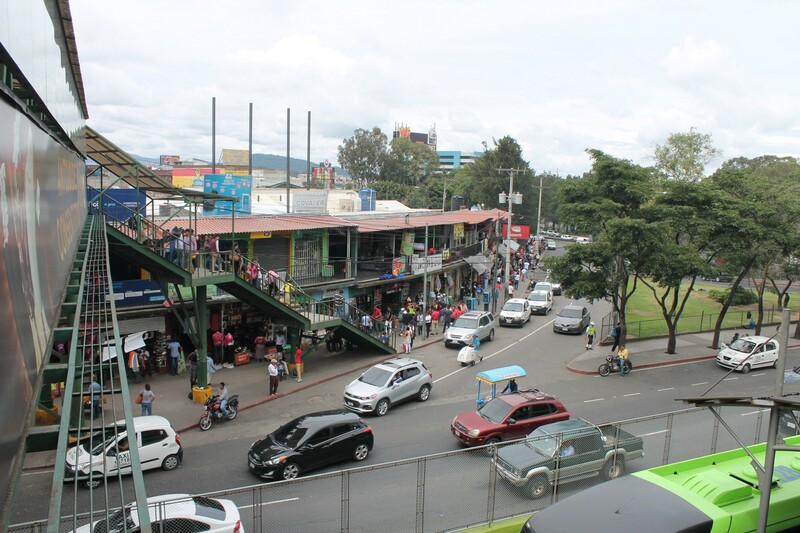 Authorities estimate that in Guatemala City, an average of 1.125 million vehicles circulate every day. Guatemala does not put limits on the age of vehicles imported to the country. Some cars and buses on the roads date back to the 1980s. According to the Guatemalan tax agency, 145,154 used vehicles were imported to the country in 2017, a five percent increase from the previous year. 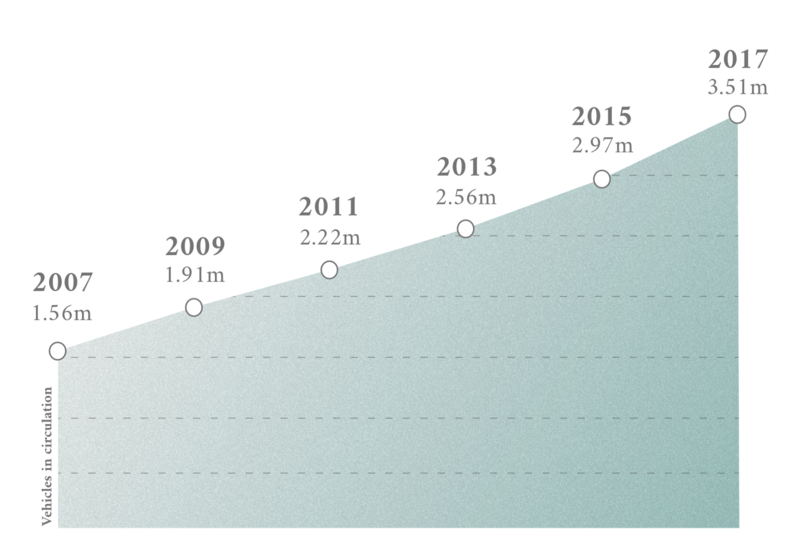 The number of used cars imported to Guatemala has increased substantially in the last decade. Data: SAT. Image credit: Federica Fragapane. Guatemala City’s bus fleet is slowly being replaced with newer models.Vehicles that run on electricity or biodiesel are inaccessible for the average consumer, but public transportation authorities can buy these vehicles at scale. By gradually introducing cleaner vehicles into the public sector, Latin American countries can reduce air pollution. The Transurbano initiative is a city program to trade out old buses and replace them with newer vehicles that use prepaid fare cards. However, recent anti-corruption investigations found that government officials and bus operators siphoned off public funds designated for Transurbano. The project has been stalled ever since. A parallel approach is to make bus services more efficient by designating protected lanes for buses and establishing right-of-way at busy intersections. The use of prepaid cards means drivers don’t have to idle, spewing fumes, as riders pay their fares onboard. These improvements are less costly than constructing a subway system would be, but can still accommodate large volumes of passengers. The local Transmetro bus network, which uses these strategies, has expanded to six lines, and the city broke ground on a seventh line in early October, 2018. Transmetro and Transurbano are popular with riders, who appreciate the shorter wait times and increased safety. However, the demand for Transmetro and Transurbano bus services still outstrips the supply. Bernardo Baranda, the Latin America director of the Institute for Transportation and Development Policy, says, “To modernize transportation systems, you need a lot of political will, and incentives in the short term.” While international development banks play a role in low-income countries by financing pricey infrastructure projects, the Guatemalan government will need to renew its own commitment to modernizing the transport sector if the country is going to thrive. According to the UN Environment Programme (UNEP), Latin American and Caribbean countries’ vehicle fleets are growing faster than those of any other region, and could triple in size over the next 25 years. A report by UNEP and the Climate and Clean Air Coalition estimates that if no action is taken, the annual premature mortality rate due to PM2.5 in Latin America will almost double by 2050. Some of the highest levels of air pollution are in smaller countries like Guatemala, Bolivia, and Honduras. These countries share several characteristics: subpar public transportation systems, low purchasing power, and a lack of strict vehicle emissions regulations. Of 15 Latin American countries surveyed in a 2014 Natural Resource Defense Council report, only seven had standards for PM2.5. Guatemalan agencies have turned for guidance to Mexico, which has implemented stricter emissions standards in recent years. In Mexico City, a program called Hoy No Circula (“Today You Don’t Drive”) prohibits most vehicles from circulating one day every week, and all vehicles must pass strict emissions tests. Mexico has also implemented “scrappage” programs, offering cash incentives to owners of the oldest vehicles to replace them with newer models. To the south, Costa Rica is a worldwide leader in clean energy, and recently adopted an innovative law that creates incentives for the public and private sector to buy electric vehicles. Latin America isn’t the only region where used vehicles are a driver of air pollution. Although the U.S., the European Union, and some countries in East Asia have made great strides in reducing vehicle emissions, many developing countries have struggled. A report released in July, 2018, by the Centre for Science and Environment (CSE) in New Delhi identifies clunkers exported to developing countries in Asia and Africa as a principal source of air pollution in those regions. The report calls the practice a form of “environmental dumping,” and recommends that developed countries implement stricter controls on exported vehicles. “If this continues unchecked, without the exporting countries sharing the responsibility of addressing this problem, the poorer countries will not be able to meet their clean air and climate mitigation goals,” writes Anumita Roy Chowdhury, the executive director of research and advocacy at CSE. Most cars exported to Africa come from the U.S., Germany, South Korea, and Japan. The CSE report recommends that developed countries set age limits on exported vehicles and adopt measures to ensure that clunkers are scrapped or recycled instead of exported. For developing countries, CSE proposes a mix of strategies, including age restrictions, taxes on imported vehicles, and improved emissions standards. Some African and Asian countries have already taken more dramatic action: Egypt, Morocco, South Africa, Sudan, Bhutan, and Nepal have all banned the import of used vehicles. In a globalized economy, developing and developed countries must both play a role in reducing emissions in the transportation sector. A clean environment is a human right, but all too often those in the developing world are left gasping for air. Back in Guatemala City, the Ministry of Environment and Natural Resources has organized a working group to draft air pollution regulations. But it’s slow going, particularly because MARN has been swept up in Guatemala’s pervasive political problems. In September 2015, Guatemalan president Otto Pérez Molina resigned following a string of corruption scandals. His successor Jimmy Morales is currently under investigation for illicit campaign financing. Meanwhile, he has set out to expel the UN-appointed anti-corruption commission that has uncovered several politicians’ illegal activities. Alfaro says that MARN has not specified a timeline to implement air pollution regulations. 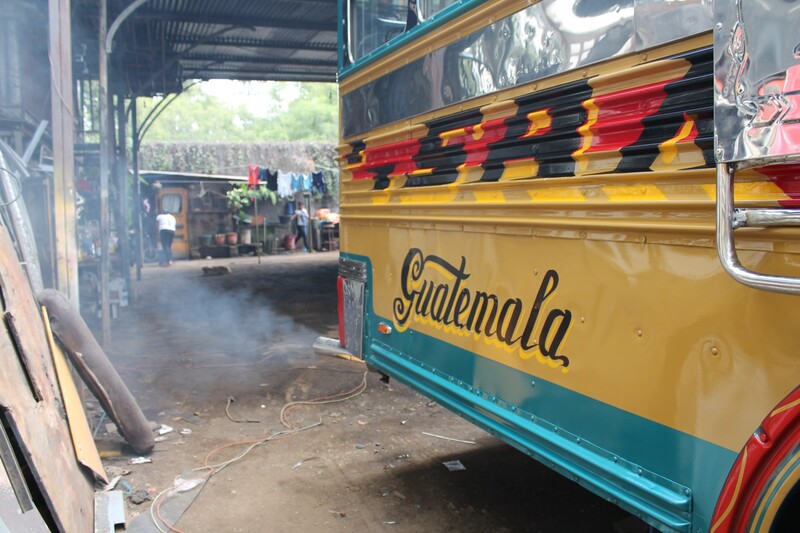 Meanwhile, Guatemalans continue to wait for improved public transportation and cleaner air. This reporting was supported by the International Women’s Media Foundation as part of its Adelante Latin American Reporting Initiative. 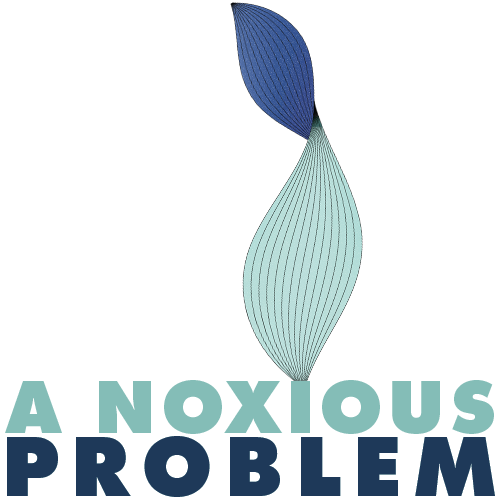 A Noxious Problem is three-part series from How We Get To Next. Click on the applause button to recommend it to your friends. For more from How We Get To Next, follow us on Twitter and Facebook, and sign up for our newsletter. Martha Nelle Pskowski is a bilingual freelance journalist based in Mexico City. She reports on the politics of urban and environmental change in the Americas. Martha is from Maryland and… Read More.